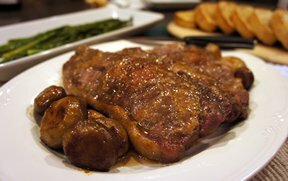 Delicious, impressive and remarkably versatile, this wonderful grilled steak recipe can be easily adapted to suit your own preferences. To save time, prepare the caramelized onions the night before. 1. 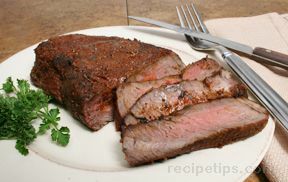 Cut a 4-inch-wide by 1 1/2-inch-deep pocket in side of each steak, being careful not to cut through back or ends of steak. Mix Marinade Mix, 2 tablespoons water, oil, vinegar and thyme in small bowl. Place steaks in large resealable plastic bag or glass dish. Add marinade; turn to coat well. Refrigerate 15 minutes or longer for extra flavor. 2. Meanwhile, melt butter in large skillet over medium heat. Add onions; cook and stir 15 to 20 minutes or until soft and golden brown. (Adjust heat as necessary to avoid burning.) Stir in remaining water to loosen browned bits from bottom of pan. Cool onions slightly. 3. 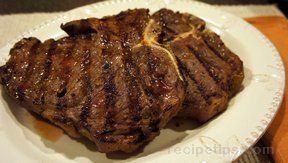 Remove steaks from marinade. Stuff each steak with 2 tablespoons each cheese and caramelized onions. Lightly press top of each steak to seal closed. 4. Grill over medium-high heat 5 to 7 minutes on each side or until desired doneness. Serve steaks topped with remaining caramelized onions. If using tenderloin steaks, stuff each steak with 1 tablespoon each cheese and onions. For Havarti cheese, use 2 (1/4-inch thick) slices in each steak. Variation: To make a wine marinade, use 1/4 cup red wine in place of balsamic vinegar and 2 tablespoons water.